We’ve studied 50 of the biggest transactional travel websites to discover how effective their booking process is in 10 key areas. As a result we’ve produced an interactive benchmark tool to help you spot opportunities to beat your competition or identify areas for improvement in your own booking process. It will take you less that 5 minutes and we’ll provide you with a breakdown of how you compare to the biggest players in online travel. 1. Auto complete in search fields? As users type a destination, the site suggests possible matches for the user based on the text entered. It allows people to search beyond specific days. For example, searching for flights from any London airport, or searching for available holidays three days either side of the dates entered. Travel sites should be optimised for mobile and therefore easy to use whatever device visitors are using. 4. Maps in search results? Maps are a great way to help travel shoppers understand their destination better. For example, they can be used to show how close a hotel or villa is to key locations such as the nearest beach, town centres or restaurants. 5. Useful content about the destination? Content on-site, ideally available during research and booking, about the destination. This could be a little local history, information on sites of interest nearby, or useful details like average temperatures. 7. Contact information during the booking process? A visible phone number or a live chat option that can be found easily during booking. It may be shown on the side of the page or in the site header, large enough to stand out. Postcode look-up tools or autosuggest options as users type an address. 9. Live trends or urgency messaging? Key information showing customers how many people are booking, how many hotel rooms available on a given date, or how long they have left to take advantage of a special offer. Booking abandonment emails are sent when users start but don’t finish a booking online. They remind users of the flight or holiday they were about to book, and provide a fast route back to checkout. 1. Auto-complete in search fields? 100% use this - you're in good company! It speeds up the process for travellers, and avoids mistakes which could lead to inaccurate or zero search results. Google claim autocomplete can speed up searches by 25%. 100% use this - you’re visitors will expect this feature, so one to look at. 50% use this - you’re among the top performers here. It allows people to see what’s available without pinning them down to specifics. Good for a broad search when they start researching holidays, and means they don’t have to narrow down their options or carry out lots of separate searches. 50% use this - so you have a chance to stand out from your competitors by adding this. 96% are - it’s just expected. Travel websites receive more than 40% of traffic from mobile, but just over 18% of sales. Making booking easy on mobile can generate more sales. Helps customers to easily see location of hotel and how close it is to key locations. For example, in walking distance to town centre. Helps them to quickly assess search results and find the information they need. 96% are - it’s just expected so get to it! Used by 54% of sites. All but one of sites without maps were airlines i.e. 98% of hotel and holiday sites used maps. Helps customers to easily see location of hotel and how close it is to key locations. For example, in walking distance to town centre. Helps them to quickly assess search results and find the information they need. Helps users to research their holiday without having to leave the site. Gives them useful information at the point when they’re considering a purchase. Great social proof, helps customers to decide what’s right for them, avoid hotels with poor service or smelly bathrooms. People don’t often book without them - 95% of travellers read reviews before booking. It’s a complex process where users may have questions, need help there and then. A clear option means sites can help customers through the process and avoid abandonment. Speeds up the address entry process, making booking easier. Also helps avoid address entry errors. Used well, it helps customers with relevant information which nudges them into making a decision more quickly. I.e if there are just two rooms left in hotel they want, they’d better move fast. 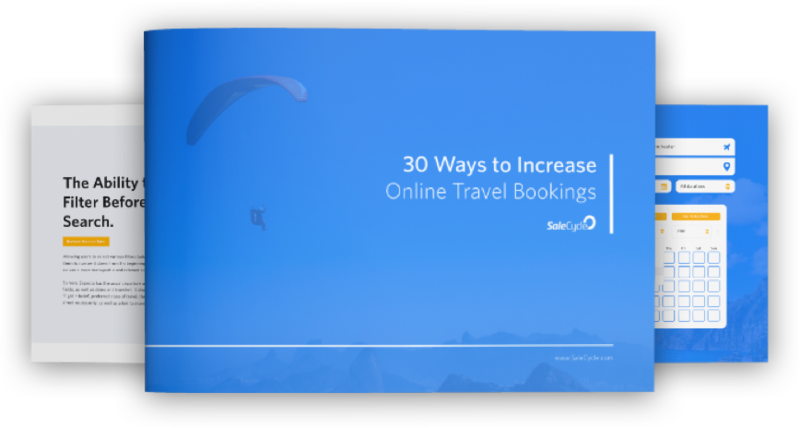 Packed with tips and benchmark stats from 50 of the world’s biggest travel sites on how you can boost online revenue and keep your customers happy. Enter your Email below to sign up to our mailing list and recieve a download link to the eBook!